"It is with great regret that Nuneaton Conservatives have to announce that Simon Rouse has tendered his resignation as the Conservative Prospective Parliamentary Candidate for Nuneaton. Sadly, Simon has decided that the inevitably heavy demands upon him as a candidate for a seat as important as Nuneaton are incompatible with his responsibility to his family. While this is a huge disappointment to his many friends within Nuneaton Conservative Association, they understand his feelings and commend him for getting his priorities right. They offer him, his wife and young son, their best wishes for the future. In the eighteen months since his selection, Simon has been an exemplary PPC, throwing himself wholeheartedly into the political life of the Association. 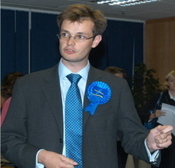 He proved to be an unparalleled campaign leader in the local elections, both in 2006 (in the North Warwickshire Borough wards of Hartshill and Arley & Whitacre, when all five seats were gained by the Conservatives) and in May this year, when the Conservatives took control of Nuneaton & Bedworth Borough Council for the first time ever. The search for a new candidate will begin at once. Simon was chosen at a public “Open Primary” meeting, after an exhaustive process of “sifting” and preliminary interviews to arrive at a suitable shortlist. The same procedure will be adopted again, to ensure that the right candidate is selected to fight Nuneaton for the Conservatives at the next general election." Its notional Labour majority of 3,843 makes the seat very attractive in the current environment. Our comment: "Simon Rouse's announcement is a reminder of how pressurised a candidate's life can be. The correct decision to pick candidates earlier than we have in previous electoral cycles makes these pressures greater. ConHome wishes Simon the very best in his future endeavours and wishes Nuneaton much success in finding a new candidate. The Tories took control of Nuneaton council at the last local elections."